What do you get if you cross great management with language barriers and initiative? - A professional, efficient team who thrive for maximum Centre occupancy. That was my impression as I left Charter Walk yesterday having spent power hours at the busy shopping Centre. I arrived on site and was met by a smartly dressed Dual Services Manager, Zed, and security officer Faisal. 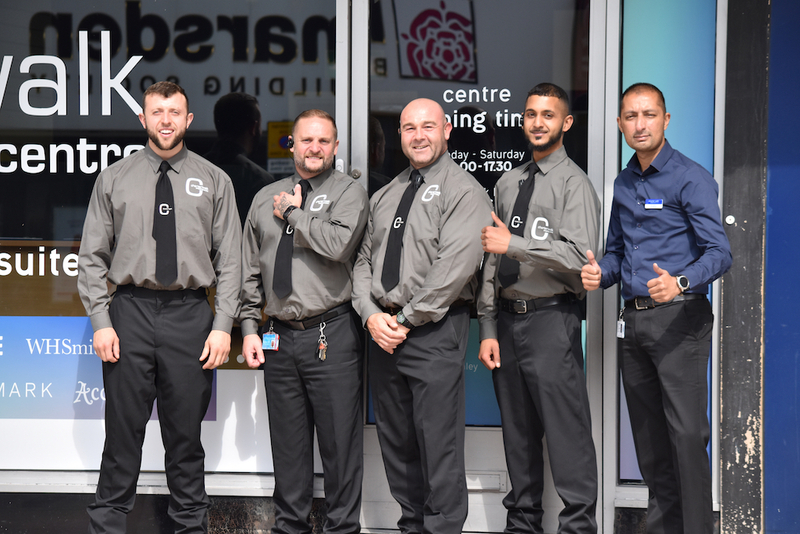 It was actually the recent feedback about Faisal and his exemplary customer service what brought about my first ever visit to Burnley. Just before the Bank Holiday weekend I received an email praising his efforts and wanted to know more about the team and what fuels this particular pattern of behaviour. So before I began my tour of the Centre, Zed put the kettle on and talked me through his approach to work. Zed explained that he encourages/ insists his team; take care of their appearance, to think about their surrounding environment and ultimately keep in mind that they are a direct reflection on him as a manager. He is very proud about his work and methods of service delivery and is passionate about the team he has managed for the last 12 months. 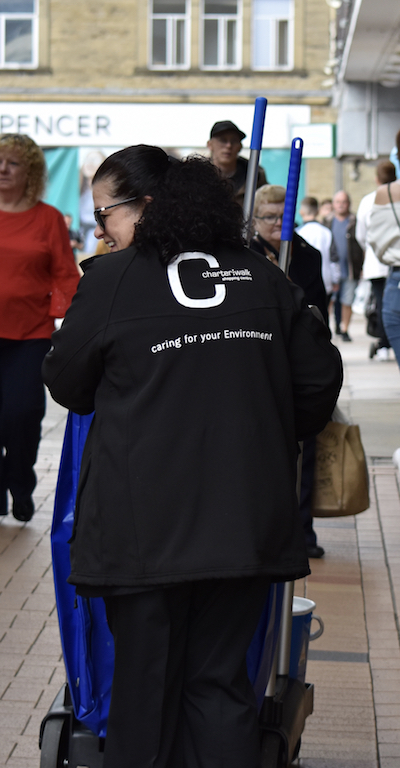 There have been many changes at Charter Walk (CW) during that time, for example, Anchor have taken on the Centre's cleaning duties, and that came with its own challenges - the team only speaking Portuguese being the major issue. But together, the Soft Service Director, Centre Manager and Zed, worked out a way of translating policy documents, procedures and induction packs, for them to fully understand what is required and more importantly, to integrate them into the wider team. Another thing they've introduced is using a popular messaging application to streamline communication between the teams. I was impressed to see language barriers broken down by translating texts, including pictures to communicate. Everyone has access to it and have it downloaded on their personal mobile phones and on the handheld devices too. And that got me thinking about a podcast I listened to a few months back by Tony Robbins, a famous business strategist/ life coach. He was talking about resources vs resourcefulness and as Zed was talking me through the changes he has been involved in over the last year, he and his team are a great example of breaking the mould of complaining about lack of resources and actually being as resourceful as they can. "It’s not the lack of resources, it’s your lack of resourcefulness that stops you" - Tony Robbins. She was astounded with the customer service she received when Faisal fetched his battery starter pack and got the car started! At the beginning I mentioned 'Maximum occupancy' this is what every Centre manager wants, it's what the property managers want, basically it's in everyone's best interests to achieve it. 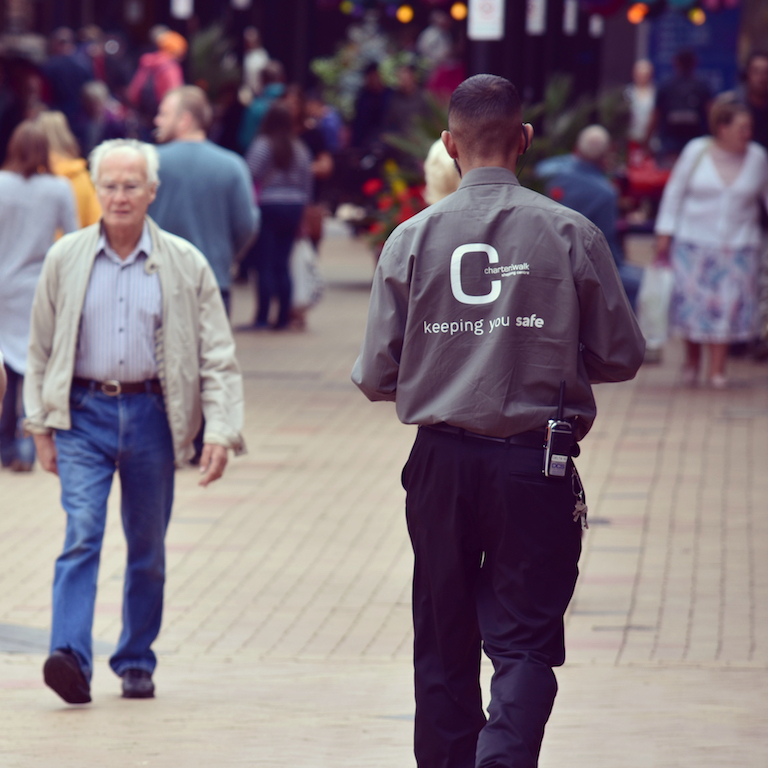 Zed explained that the opening of a Primark store earlier this year has completely uplifted the footfall in an area which had been experiencing a noticeable decline and the addition of Millies Cookies opening in Market Square has also been very popular. Actually filling empty units is out of the frontline team's hands, but building confidence in existing occupied units does help. Zed told me what they do there to protect tenants and give them added piece of mind. He said; "Spare radios have helped where camera coverage falls short, we can offer a store a 'loan radio' so if there is a particular persistent problem or they feel unsafe for whatever reason, we can add them to a wider security link system with over 80 shops, (not before training them to use the radio properly) and then we increase patrols in that area and the hotspots are covered until the problem is resolved". If the Centre has an empty unit, they make good use of it by utilizing it for events, last year they opened a vacant unit and used it for an exhibition. The next event at Charter Walk is on 29th Sept for the Literacy Festival. 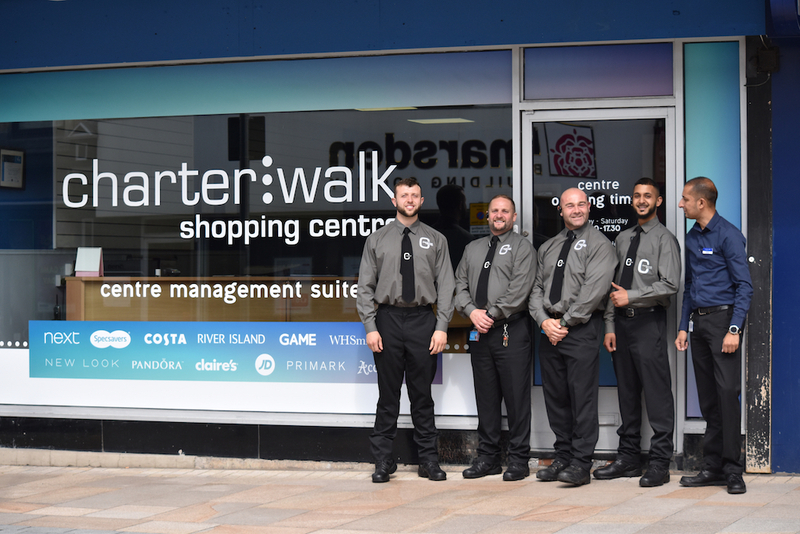 There's a lot of initiative at Charter Walk and it was a pleasure to speak to all the team. Recently promoted Anthony King, commented that seeing Soft Service Director Roz frequently; "is refreshing! She's a great mentor, I have a lot of respect for her, every time I speak to her, I take something new away"
Big thanks to Anthony, Robert, Ian Faisal and Zed. (And Ross, who isn't pictured, but was really helpful on the day) and to the cleaning team for allowing me to photograph them at work.